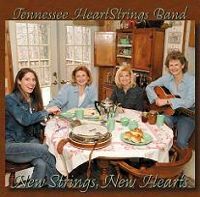 Casey is featured playing some mighty fine banjo on this new CD from Tennessee HeartStrings Band. THSB is an all-female bluegrass band based in Nashville, Tenn. They play lots of good original music and are known for their outstanding vocals and tight harmonies. One of Casey's original tunes, "St. Simon Says," appears here. She also sings lead on "Georgia," a tune from the pen of her aunt Nancy Pate. Chris Henry adds his mandolin to three tracks.